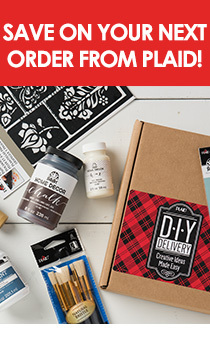 We’re going batty this month with Mad About DIY! A modern mix of Martha Stewart Crafts® Multi-Surface Satin Acrylic Craft Paint colors gives us a spook-tacular Halloween palette to inspire our latest three projects. Use inexpensive glass jars with plastic trinkets to make these party perfect Creepy Crawler Jars. The pine-apple of your eye needs this simple Pineapple Baby Onesie Costume idea! Create a Pumpkin Candy Holder from a craft pumpkin and decorate with stencils for the ultimate in DIY self-serve. Share your ghastly crafts with us by tagging #plaidcrafts, and make Martha Stewart's Bat and Cobweb Cookies for a special treat!